CBDREEM is a veteran owned, Cannabidiol food additive company, with all products produced in the U.S. CBDREEM was founded March, 2015. Our products are all infused with 99% pure CBD, are compounded by a Licensed Pharmacist in an ISO4 clean room to ensure quality control, and are bottled and sealed by an FDA registered and approved bottling company. Each batch is also assigned a lot number to provide full traceability of the CBD source. Since our inception, we have found that many companies ONLY test the CBD PRIOR to creating their end product. We work to lead the market in quality measures and therefore utilize multiple reputable 3rd party laboratories to test our END PRODUCT to ensure CBD concentrations per milligram are reflective of our claims. CBDREEM is the only CBD infused syrup with a Patent Pending method of infusion. 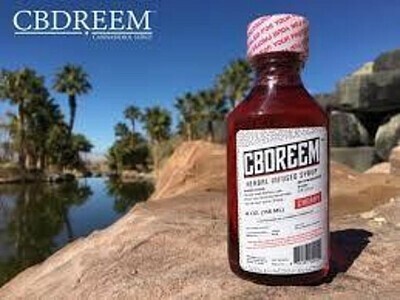 OUR VISION CBDREEM is the #1 CBD infused syrup on the market. Our food additive products introduce a new and innovative way to introduce CBD into our customer’s daily diet. We are on a mission to inform the world about CBD and to introduce it to anyone who was unaware of its “potential” affects and legality. We strive to produce the most effective, high quality CBD infused syrups available on the market. A relaxing and unwinding CBD experience CBDREEM is a CBD-based, herbal infused syrup that has been positively received among the "sippers" culture in the south as well as our friends on the East Coast. While new to the California market, CBDREEM has sparked enough curiosity among the cannabis community to generate some waves. Patients have told us they've enjoyed it simply with water as a nightcap before bed while others added it to their already-medicated drink. FLAVORING IS GLUTEN AND SUGAR FREE!! !